When there are swelling cloud parts on the surface of an unbroken cloud cover, it sometimes can happen that the shadow of a pole projected onto this cloud cover appears kind of broken. I could observe such a shadow broken perspectively on August 18, 2007, at 18.15 hours CET on the top of Mt. 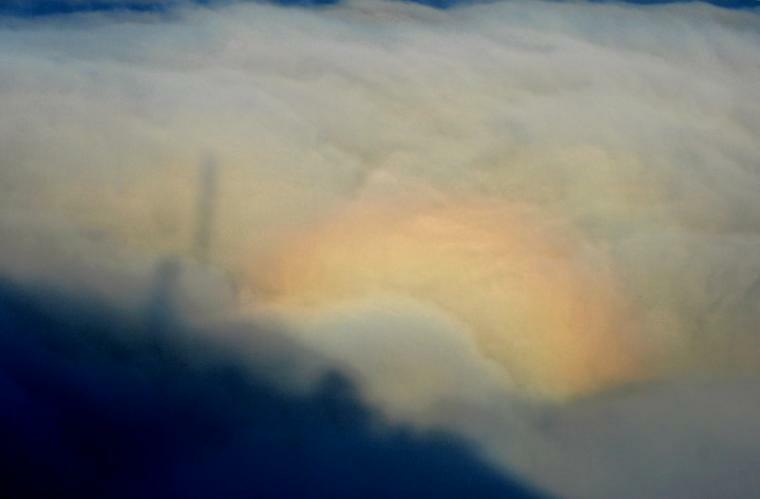 Wendelstein (1835m), when the shadow of the transmitting aerial of the Bavaria Broadcast fell upon such a cloud cover, surrounded by a glory which appeared three-dimensional. Posted on May 15, 2011, in glory and spectre of Brocken, observations, shadows and rays and tagged glory, Mt. Wendelstein, shadow, spectre of Brocken. Bookmark the permalink. Leave a comment.